Despite the dominance of trucks, SUVs and crossovers in the auto market at the moment, the midsize sedan segment is still as fiercely competitive as it's ever been. It's probably fair to say the midsize segment has never been so blessed with sensational cars as it is currently, but one car is still setting standards for the rest to be judged by, and that model is the 2017 Honda Accord. And if the regular sedan isn't quite what you're looking for, the evergreen Accord is also available in coupe form, and a hybrid variant is also offered for buyers who put fuel economy and the environment at the top of their list of priorities. The new model year sees a Sport Special Edition trim level added to the Accord family, which sits in the lineup between the Sport and EX models. The Sport Special Edition gets leather-trimmed seating with red stitching, heated front seats and special edition badging on top of the existing Sport model's standard features and equipment. The ninth-generation Accord benefitted from a mild refresh only last year, which introduced a new bolder grille design, redesigned taillights, and the Honda Sensing suite of collision avoidance technologies. The exterior of the 2017 Honda Accord isn't an exercise in science fiction by any means, but it's certainly contemporary, handsome and aerodynamic and it's instantly recognizable as an Accord from the moment you see it. For something a little sleeker and sportier, the Coupe takes the Honda's winning formula in exactly that direction, which certainly adds to the broad appeal of this excellent car. The 2017 Honda Accord pretty much offers everything buyers want in this sort of vehicle as far as the engines are concerned. Most models get a 2.4-liter inline-four producing 185 horsepower and 181 lb.-ft. of torque as standard, which rises to 189 horsepower in Sport models due to the dual exhaust system. There's still a six-speed manual transmission option, which is now becoming increasingly rare in the segment, as well as a continuously variable transmission (CVT). The latest Accord also defies current convention to a degree, by still also offering V-6 engine option in the form of a 3.5-liter unit developing 278 horsepower and 252 lb.-ft. of torque. The V-6 gets a six-speed automatic transmission as standard, but the Accord Coupe is available with a six-speed manual if you prefer. What's now the 2017 Honda Accord has been around in its various incarnations for a good while now, so if you're not overly familiar with recent versions you could be forgiven for having modest expectations of the standard features and equipment list. 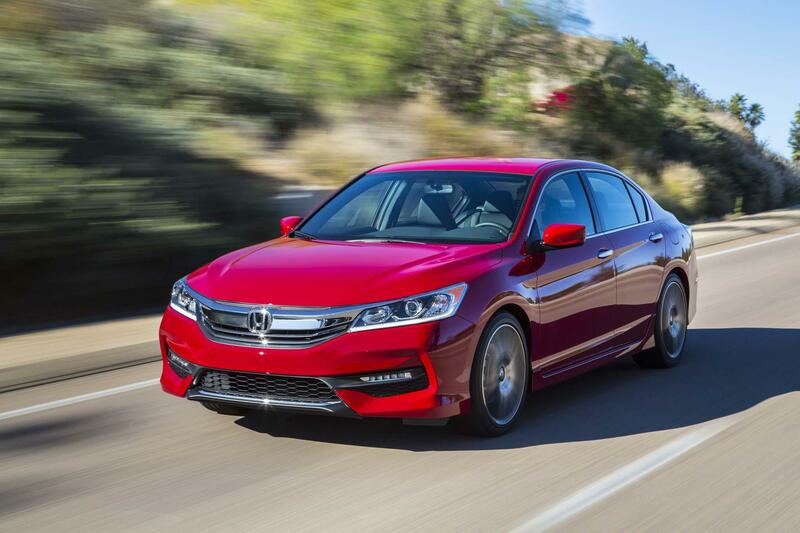 Accords of the past could be relatively basic at the entry level, but that's certainly no longer the case with today's car. The base model is the LX, which comes standard with: dual-zone automatic climate control, 16-inch alloy wheels, Bluetooth connectivity, a rearview camera, and an 8.0-inch i-MID display, and Pandora audio streaming with text-message capability. Choosing a V-6 variant then gets buyers an even more impressive cabin with superior appointments, while EX-L trims of the 2017 Honda Accord include a 360-watt sound system with Aha internet radio streaming. However, going the whole way and opting for a top-of-the-line Touring model means you'll then be entering the realms of true luxury models, but without having to dig deep to raise the money for a prestige price ticket to go with it.